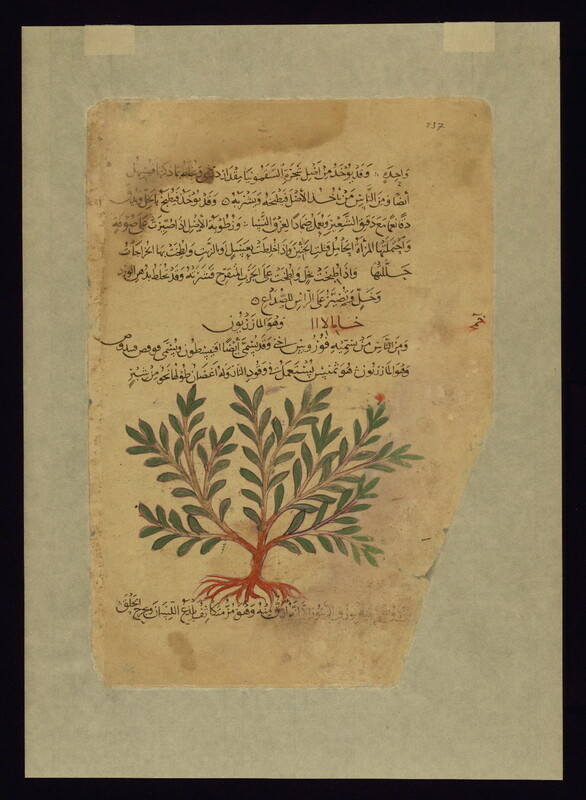 This is a single leaf from a dispersed manuscript (Aya Sofya 3703, later Top Kapi Seray 2147) of the Arabic version of De materia medica by Dioscorides (fl. ca. 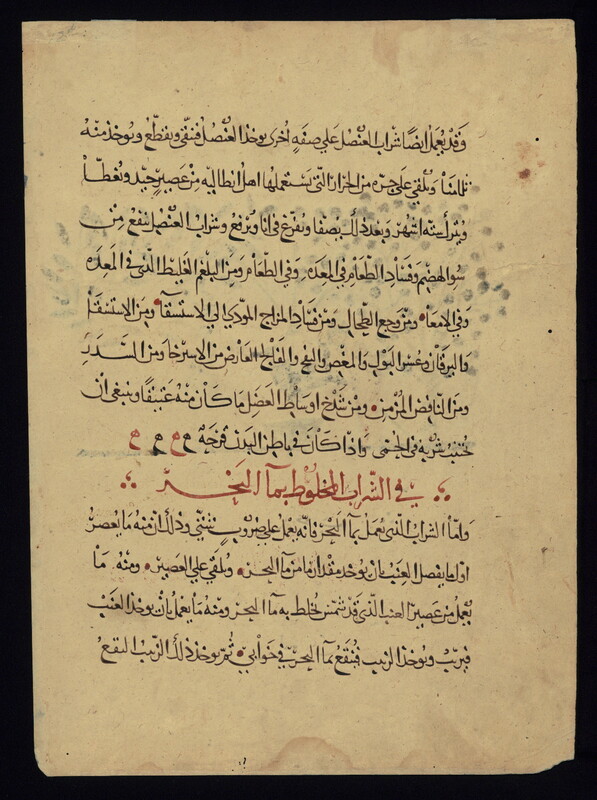 65 CE) that was copied in 621 AH / 1224 CE in Baghdad. Approximately thirty illustrations were removed from this parent manuscript that are now in public and private collections. The Walters' leaf depicts two doctors preparing medicine. A funnel is set on a tripod over a vessel. The two men preparing the medicinal draught stand on either side of the tripod beside two fruit trees. The text is written in partially vocalized naskh script in brownish-black and red ink. Label: This illustration depicts two doctors preparing medicine. 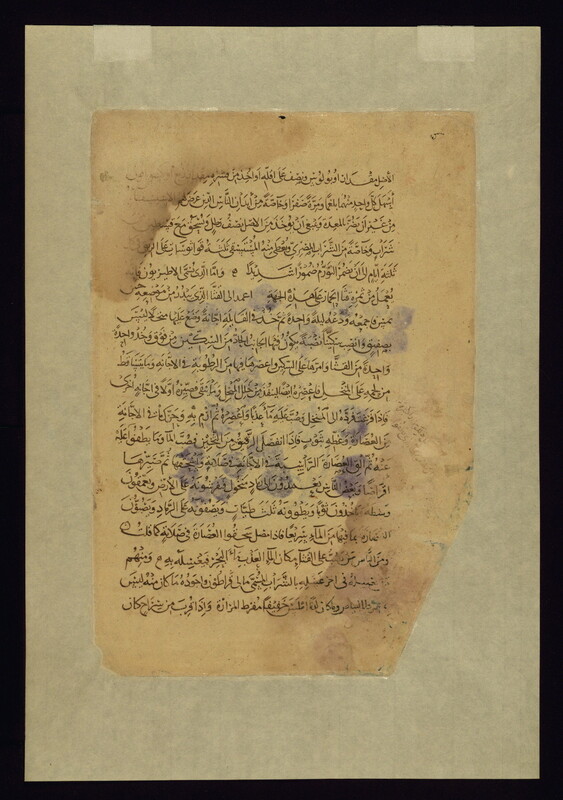 The text is written in partially vocalized naskh script in brownish-black and red ink. These are four consecutive leaves (numbered fols. 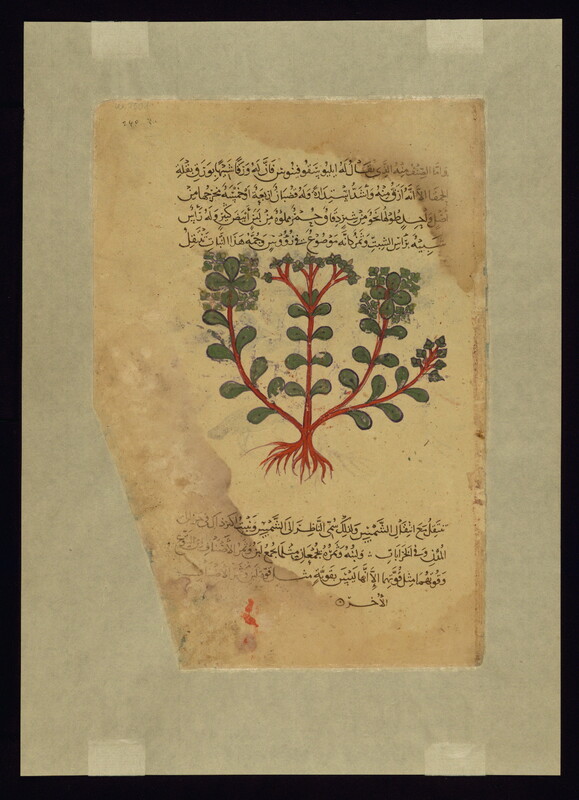 237-241) from an illustrated manuscript of the Arabic version of De materia medica by Dioscorides, copied in the seventh century AH / thirteenth CE in Iran. Pedanius Dioscorides wrote his treatise on medicinal plants in the first century CE. It was translated into Syriac and then Arabic in Baghdad in the third century AH / ninth CE. [This is the text of the cataloguers. There was more than one Arabic translation of this text, at least one or perhaps even two were made directly from a Greek text.] 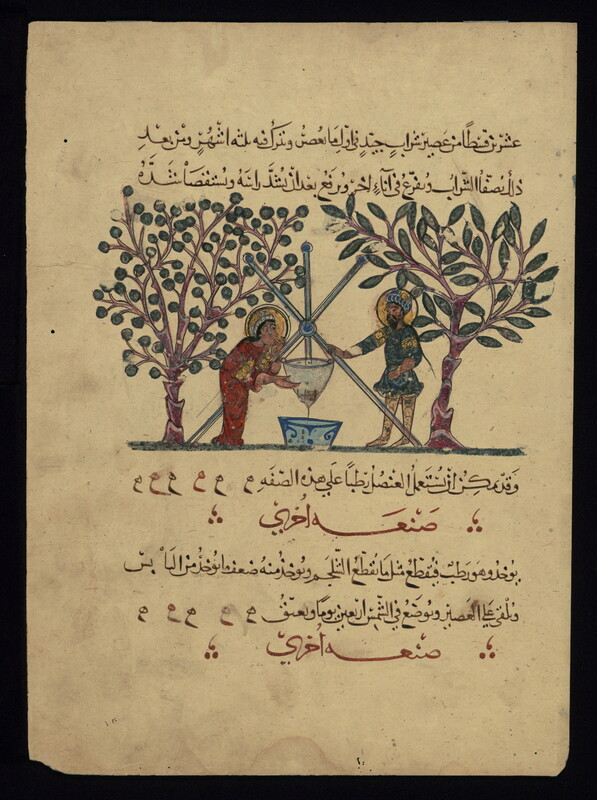 De materia medica by Dioscorides was one of the earliest scientific manuscripts to be translated from Greek to Arabic. The Walters' leaves illustrate five plants: wild cucumber, mezereon (spurge-olive), and three varieties of thymelaea (spurge-laurel). 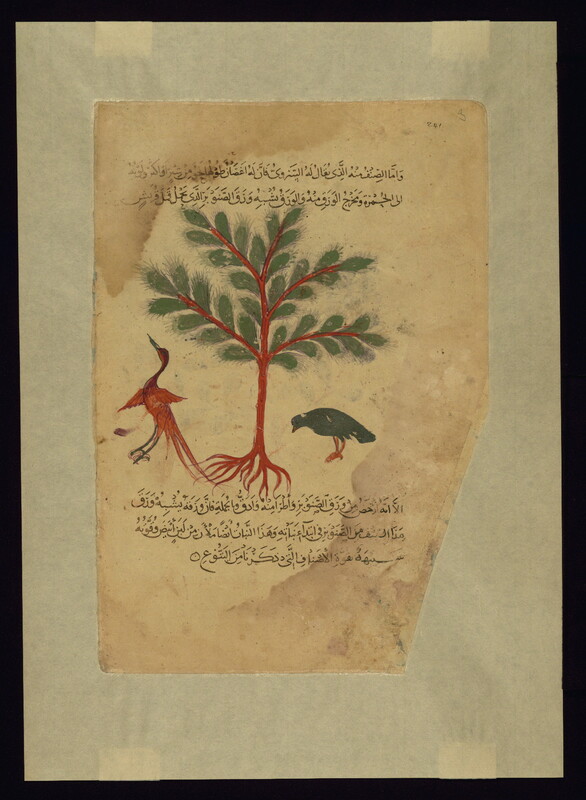 Label: This illustration depicts wild cucumber (qathāʾ al-barrī or qathāʾ al-ḥimār). 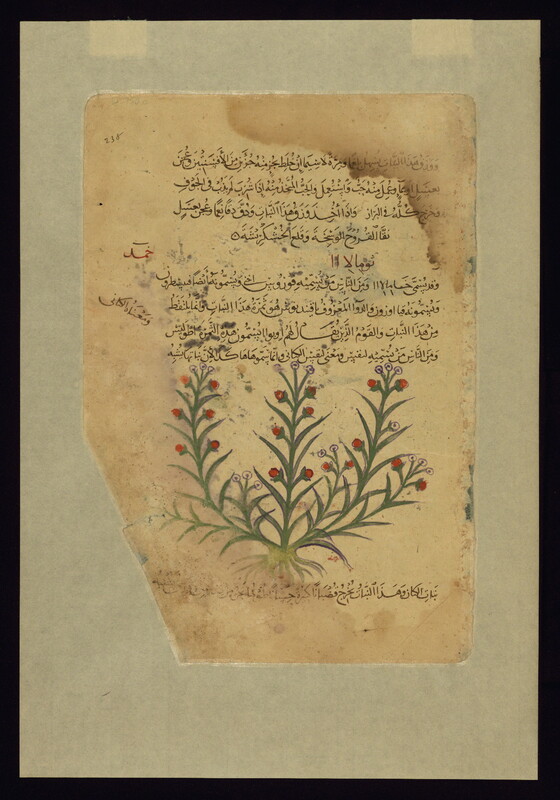 Label: This illustration depicts mezereon (spurge-olive) (khāmālā, māzaryūn, fūrūs). 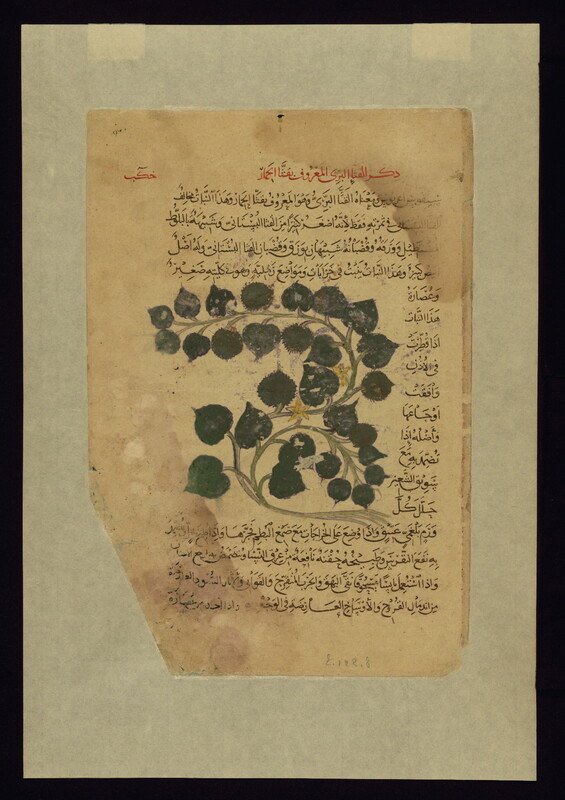 Label: This illustration depicts thymelaea (spurge-laurel) (thūmālā, khāmālā).